The major and noticeable development in your child take place till age of six years. This is the time frame when you can teach them as much as possible as the learning they attain at this point, help them in their later growing years. Whether it is about instilling good manners or enhancing their knowledge bank, everything has to happen at this stage in a precise way. There are many things you need to teach your toddler as he or she steps into the pre-school and learns the preschool manners . Like writing, singing rhymes, you should even help your child develop the reading skills as it will even contribute in improving the speech and language skills. Here check out how you can make your toddler read efficiently and encourage him or her to master the art. Developing reading skills in your preschooler is the most challenging task for parents, but you can make it easy by following some of these basic tips. When introducing the alphabets, don't just focus on the writing part. Make sure your child reads the letters aloud. To teach the alphabets, you can bring puzzle games, large blocks that contain pictures and letters that your baby can easily recognize. Every time your baby comes across a letter, make him or her say it out loudly. Always ask simple questions related to everyday life. For instance, ask 'what is Your Name', 'which fruit you like the most' etc. When you make your child answer questions, it develops the vocabulary and speech which further help when the reading lessons are practiced. Bring in some nice story books especially designed for the pre-schoolers. Here the lines are very short and thus help the child in identifying the words and reading them without much of difficulty. If possible, take some time out and read along with them, this also brushes their reading skills. Practice what you preach. Yes, this one's very important as kids often follow your habits. Even if you are not an ardent reader, try reading some magazines, newspaper or any other subject you are interested in. When your kids will watch you reading, they will also develop an interest in it. 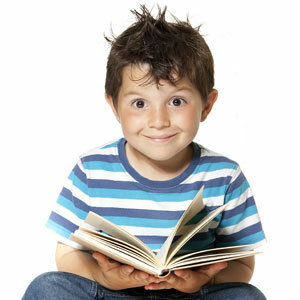 Reading habits from early age will instill positive motivation in your child. This will even be a great help in their life ahead and let them know of the world around.